Meeting with Compassion and Treating with Dignity. 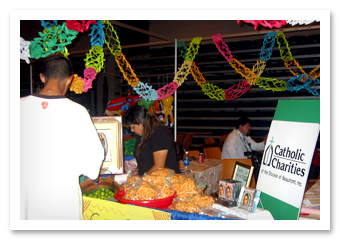 Catholic Charities of Southeast Texas is the only non-profit inSoutheast Texas recognized by the BIA and U.S. Citizenship and Immigration Service (USCIS), formerly known as Immigration and Naturalization Service (INS), to provide legal immigration services to clients. The Immigration Services Director is accredited to represent clients in immigration matters before the USCIS. Training is an essential part of our program and is required to obtain and maintain BIA Accreditation. Each year, staff attends national trainings on Immigration Law given by immigration law experts. In addition to attending trainings staff is involved in attending meetings with USCIS and other community based organizations allowing us to keep abreast of current immigration law and changes in the law. A Lawful Permanent Resident of the United States may petition for his/her spouse and unmarried sons and daughters. A United States Citizen may petition for his/her spouse, children, parents, married sons and daughters, and siblings. Waiting times differ depending on what family relationship the petition is based on. If a person wishing to immigrate to the U.S. and has an approved family-based petition for which the priority date is current, he/she may be eligible to apply for adjustment of status with the local U.S.C.I.S. Complete consultations are necessary in order to assess an individual’s eligibility for adjustment of status. Persons outside of the United States and certain persons inside of the United States conclude the processing of their visas at the American Consulates abroad. The Immigration Services program is able to assist these persons with the preparation of final documentation necessary for consular visa appointments. Residence in the U.S. for at least one-half of the 5 years. Anyone who has entered the U.S. before Jan. 1, 1972 can adjust his or her status through Registry. You must show substantial proof of continuous residence in the U.S. since that time. Our staff upholds the confidentiality of all information disclosed by clients. Information is NEVER released to outside parties unless the client has expressly granted his/her written permission. Client fees are vital to ensuring financial viability for our program. Private and public funding for immigration counseling programs is scarce. Fees for services are discussed with the client at the onset of a case. Our fee schedule is nominal and all clients are screened for financial eligibility to determine if circumstances warrant reduced or waived fees. Member of Catholic Legal Immigration Network, Inc. (CLINIC).